Senate President Bukola Saraki and House Speaker Yakubu Dogara are absent from Eagle Square Abuja, where the 58th anniversary of the nation's independence is being held. 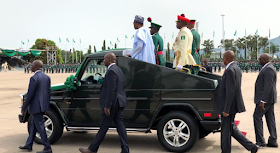 Present at the parade is President Muhammadu Buhari. his vice-president, Yemi Osinbajo. Nigerian leader Walter Onnoghen, and former head of state, Yakubu Gowon, among others. A photo exhibition depicting the history of Nigeria and a day of independence dinner are also slated for today as part of the ceremonies marking the 58th anniversary of independence.